Lifetime’s name has been highly spoken of among the members of the kayaking community. That is why we’ve read many Lifetime kayak reviews. What we’ve concluded so far is that Lifetime products leave an overly positive impression on their reviewers. Today, we’ll be testing another Lifetime’s kayak which is the Lifetime 10 Foot Tandem. Here is a quick recap on what we think of this kayak. A kayak refers to a small (usually quite narrow) boat. The movement of these watercrafts is solely powered by the use of double-bladed paddles. In design, it is very similar to a canoe (although their design can vary depending on the type of the kayak). Over the years, the kayak has evolved from a simple means of transportation to a specialized vehicle. There are two main categories which unify several other groups and variations of kayaks. These are ‘Sit-In’ and ‘Sit-On-Top’ kayaks. These can be further divided into racing, fishing, surfing, whitewater, touring, and recreational kayaks (recreational being the most common type). Lifetime boldly advertises this kayak as being extremely suitable for fishing. That might seem like an overstatement or a shameless promotion of this product. However, upon closer inspection, we can definitely affirm that Sport Fisher kayak does more than just deliver. The whole hull consists of high-density roto-molded polyethylene (HDPE), which makes the whole kayak sturdy and stable. Not only does this high-density polyethylene make it durable but also resistant to fading, cracking, and peeling. Additionally, this kayak was designed to seat up to three people (which almost equals to 500 pounds). The kayak itself weighs about 65 pounds. It stretches 10 feet in length and 3 in width. We’ve already mentioned that there are two primary kayak categories. This one belongs to the second group (Sit-On-Top kayaks) because its cockpit raises you above the top of the kayak. Considering that this is mainly a fishing kayak, higher usually means better since you have the ability to reach more with your fishing rod. On the other hand, being propelled on a higher seating implies less stability, so it’s definitely a trade-off. Sport Fisher kayak features two padding backrests, which make the tandem use that much safer. Note that this is generally a slow and heavy kayak. That alone tells you that you don’t have to worry about being thrown off into the water. To back up this statement further, there are multiple designated footrests. They are molded into the deck and along the body of the hull. One downside is that they sometimes catch and keep the water away from the scupper holes. Speaking of which, there are two scupper holes which drain out the excess water and maintain its level. Getting splashed is inevitable; however, you won’t be sitting in a puddle of water. The hull offers ample space for several people. The back of the hull has a reserved space for an optional trolling motor. That can come in handy when paddling becomes too much of a labor for you. The inside of the hull features a 6’ storage hatch, which is, to our own surprise, quite spacious. Even though the kayak can easily support three adult people, we advise against it as it increases the chances of tipping over. We’ve noticed that having one fellow traveler is the most optimal solution. That way, you have greater control over the space management (rod placement, storage space, etc.) as well. Another downside of this kayak comes in the form of poor placement of the built-in rod holders. There are three of them (two of which are in the back and one in the front). The problem is that these holders only keep the reels just a couple of inches above the water level. Some of you might not consider this to be problematic. Nevertheless, we pointed it out as a potential inconvenience. Moving on to how portable it is. When it comes to portability, there are several handles that allow for easier transportation. The kayak has a handle on each side and one on the front. It’s pretty lightweight, so maneuvering it from your truck/car into the water shouldn’t be a problem. There are some people who experienced difficulties when trying to lug it down on their own. There’s a potential inconvenience. However, simple problems often have simple solutions (just ask someone to help you). 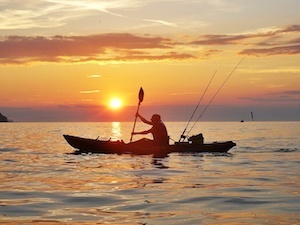 What separates Lifetime Sport Fisher kayak from the rest is that it comes with everything you need. In addition to the kayak itself, you get two paddles and two padded backrests. The paddles consist of two parts that you can connect via a small spring in the middle. There are three possible angles, and those are low, middle, and high. 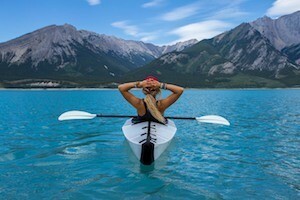 Most companies tend to sell paddles separately or charge extra for them to be shipped along with the kayak. Considering that paddles can run from 30 to 150 dollars a piece, we can say that this is definitely an excellent deal. Even if these were the cheapest paddles, that’s immediately about 60 dollars that you don’t have to spend. Editor's Note: With all its cool features, free equipments and affordability, we are sure this lifetime kayak will be worth every penny! Lifetime Sport Fisher surely packs a lot of useful features. Let’s summarize everything positive about this kayak into this brief segment for an easier overview. ​Most assuredly, the biggest plus is that you immediately get everything that you need in order to use your kayak. That means that you don’t have to wait to save up more money for paddles and other extras. Instead, you can take the kayak straight into the water and start paddling away. 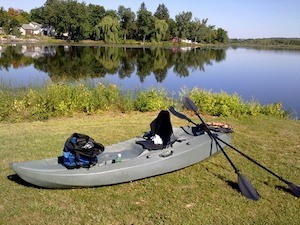 Lifetime Sport Fisher is a relatively cheap kayak in comparison to some of the other contenders. The price ranges from around 500 to 550 dollars. Keep in mind that the price can vary depending on where you order and buy it from. Kayaking can be quite an expensive hobby, especially when you consider all the additional equipment that you need to buy (rods, bait, etc.). Stumbling upon an offer like this can rarely be a deal breaker for anyone who monitors the prices regularly. This kayak features an innovative compact design that also manages to be sturdy and durable enough to withstand everything. There is enough space to store whatever you need to bring along with you. Additionally, you can sit in your place without having to worry about hampering the movement of your travelling companion (provided that there are two of you). It wouldn’t be right to say that this is a perfect product as such things do not exist. That being said, this kayak is not without its drawbacks. Here’s a shortened list of what we thought could be an inconvenience. It’s always important to keep your reel out of the water. Unfortunately, the rod-holders on this kayak do not keep the reel at a sustainable level above water. The holders are placed too low (in our opinion) and manage to keep the reel just a few inches above the water level. Considering that your kayak will swerve and jump around at times, your reel is liable to get wet. The kayak has only two scupper holes, which is kind of strange since most kayaks tend to have more. We think that these scupper holes do not drain out the accumulated water within the kayak effectively. However, you won’t be sitting in your kayak, but rather on top of it, so it won’t bother you that much. 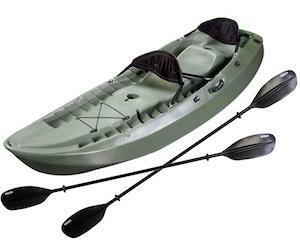 This is a fishing kayak. That alone means that it wasn’t meant to be used in windy conditions. Paddling against a strong wind might prove to be a challenge due to its lightweight design. Lifetime has managed to elevate their status as a company on an enviable level. The reason for that is the quick manufacturing of their high-quality products. The fact that they load their products with a great number of features for a decent price speaks for itself. 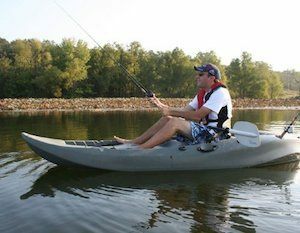 Some people regard this kayak as being the ultimate fishing one. Considering the extra accessories that come along with it and its price, we think that it’s definitely worth it. We would recommend this to anyone who wants to have a decent recreational kayak without having to overpay it. That is why this kayak made it into our list of Lifetime kayak reviews.